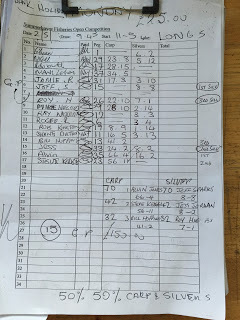 On Longs today and the format was the same as yesterday with the top three silvers and carp anglers framing and the payout split down the middle between carp and silvers. I went into the draw bucket late again as it had worked okay in the last couple of matches and this time peg 31 was the result, it wouldn’t my first choice but it’s a decent silvers area and I was happy enough. I really felt for Roger as he was on ‘Cyanide Straight’ peg 6 again and just can’t seem to get away from it, Glynn was also in the same area on peg 1 and wasn’t happy. His Dad, Ray, on the other hand was pretty pleased with peg 12 which is a great silvers peg. Along with my usual side bet merchant Glynn, Rob Kingston was fishing today and we normally have a nugget on it so I suggested silvers which he agreed to but then said we should also have a pound on overall weight. I had Nigel Wickham on my right on peg 29 and Jess Jordan was on my left on 33, I set up a 14 x 11 MW F1 Slim for the ten metre lines and a 0.3 gram NG XT Mini Gimp for five metres. It was pretty windy and I like to try and pack away any items of tackle that I’m unlikely to use so I haven’t got to worry about it getting blown around or worse still, ending up in the lake! I’ve got a battered old number four section that has seen better days and I’ve broken twice already but I’ve been using a short number four so put it by my rod holdall out the way. I was ready with about 15 minutes to go and as I was having a cup of coffee, Ray Wickham turned up for a chat and as we were talking he stepped forward, there was quite a loud CRACK and looking down my number four was now in need of a third repair! To be fair, the section was pretty knackered anyway so I telescoped it through and put some gaffer tape around it and it would do in an emergency. Jess, Nigel and Alvin Jones arrived and we all reckoned Ray was either trying to nobble the opposition or he had shares in electrical tape! With five minutes until the start, Ray headed back to his peg and I breathed a sigh of relief that I still had some pole left to fish with! On the whistle I cupped in half a pot of micros on two lines at ten metres and the same at five metres before starting on the left hand line with a 4mm expander on the hook. After a few minutes, the float sailed away and the strike resulted in yards of blue hydro streaming from the pole tip as a carp made a bit for freedom! It came off but the next bite was from a small carp and then I had another and this wasn’t in the script. Nigel on the other hand got off to a flying start with three decent skimmers in as many chucks and Jess netted a couple of fish as well. I switched to the right hand line and my first bite here was from a carp as well! I did manage one better skimmer before the first sixty minutes was over and hopefully things could only get better! Nigel slowed up after his flying start and Jess seemed to be having the same problem as me with as he hooked carp after carp! I was getting the odd small skimmer off the left hand line but it wasn’t really happening. Ray over on peg 12 looked to be struggling as well and I’d only seen him net one fish, I did hook another good skimmer but it came off as I shipped back and I didn’t think I’d be collecting any envelopes today. Jess shouted down that Alvin on peg 35 was fishing meat down the track and in the margins and catching carp really well but was also catching some good skimmers, crucians and tench! And he made sure he showed Jess every time he caught a good skimmer, I was just glad I couldn’t see him! So after two hours I only had about a pound of silvers and just couldn’t catch any quality and if the float went under it was a small blade, tiny roach or a poxy carp and then it started raining! For the second day running I had to put my coat on and it certainly didn’t feel like we were in May! I won’t give you a blow by blow account of how I didn’t catch very much over the next few hours but I stuck at it because Rob Kingston walked up and he hadn’t had much either so there was still £2 to fish for. Jess had come in over his short line and had a run of decent skimmers so after four hours I tried my five metre line but all I could catch was small skimbobs and the odd carp, tiny fish were also proving very problematic so I switched to a red 6mm Marukyu JPz pellet and had a few more blades and small roach but it was short lived. I had a couple of carp that I would have sworn were tench or crucians until they came to the top and then with literally seconds to go I did hook and land a tench around 12oz. I ended up with that tench plus fifteen skimmers and a few roach which I didn’t count for not very much and probably a dozen small carp. I packed up and took my kit back to the car as Pete and Adie started the weigh in over on peg 1, as I was loading the car Glynn came back and said he’d weighed 6lb 2oz of silvers so I gave him his pound back from yesterday. Roger had 3lb 4oz of silvers from peg 6 and then Exeter Mike on peg 9 had 28lb 10oz of carp and a lovely perch of 2lb 14oz. Shane on peg 11 had 16lb odd of carp and 3lb 13oz of silvers, Ray had 3lb 3oz of silvers and then the ever consistent Bill ‘The Paste’ Hopping had 41lb 2oz of carp from peg 13 to go into the lead. Jeff Sparks was on peg 15 which was also the golden peg, he drew it a couple of weeks back and fell just short of a bumper payday when Glynn beat him by a few ounces, could he go one better today? He had some good skimmers to go into the silvers lead with 8lb 8oz, Rob Birch had 28lb 15oz of carp from 17 before we got to Rob Kingston on peg 19, he had 8lb 9oz of carp and 1lb 14oz of silvers, I thought I had him beat on the carp but it would be closer with the silvers. 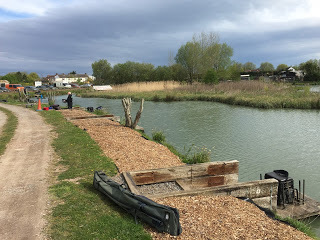 Steve Kedge was next and after a slow start he’d caught well in the last couple of hours and and went into the lead with 56lb 11oz from peg 23, Roy Hughes had 22lb 10oz of carp and then his 7lb 10z of silvers put him in second place, Nigel just pipped Roy with 23lb 8oz of carp but fell short on the silvers front with 5lb 12oz. Then we got to my peg and my carp went 17lb 3oz and my silvers weighed 3lb 10oz which surprised me so at least I had £2 to come from Rob. Jess had 8lb 2oz of skimmers to go into second place and then Alvin had 16lb 2oz of silvers to thwart Jeff’s bid for the golden peg fund once again and he then had the best carp weight as well with 66lb 4oz but would only claim one lot of pools as there was no ‘double bubble’ today. Mark Leahy was last to weigh and had 34lb 5oz of carp from peg 37 but had lost enough around the aerator rope to frame. So a disappointing day for me but that’s fishing! Next week I’ve got another double header with a charity match at Harry’s on Saturday and then it’s back on Sellicks and Lily on Sunday.